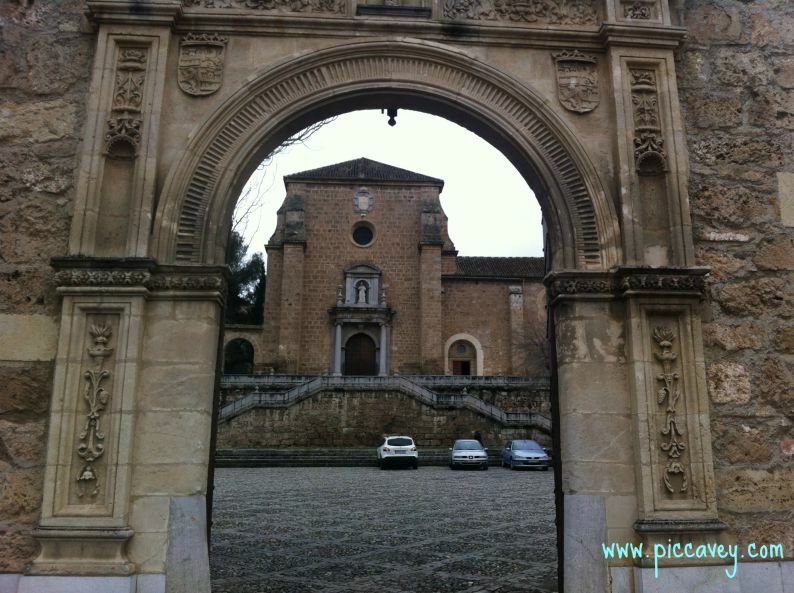 Cartuja Monastery is one of those places that had been recommended to me many times. Until now I hadn´t visited. The entrance is just off the main road from Granada to Alfacar. Once inside the doorway the first thing I saw was the beautiful cloister. Following the arrows to guide us through the building the first room was a small area with an altar. This is where the Carthusian monks would have washed before entering the dining room. This site had monks living here for several hundred years, from the early 1500´s right up until 1835. 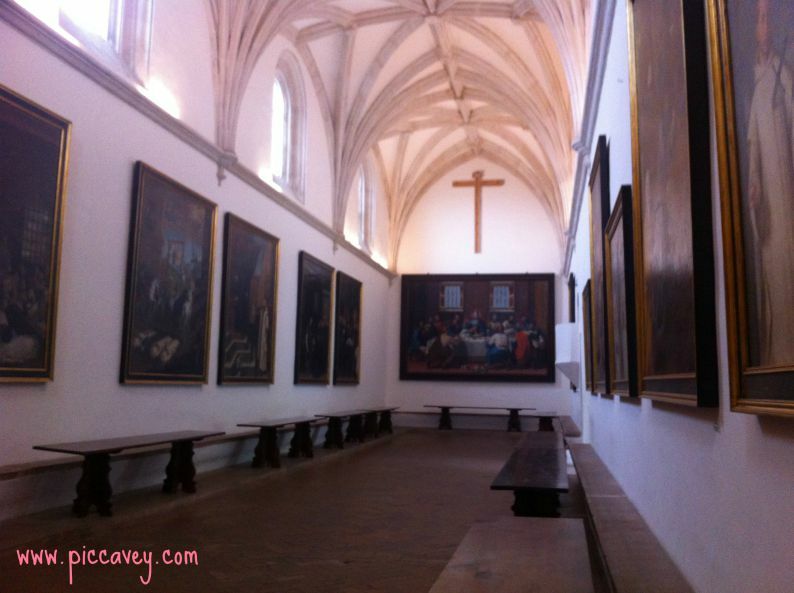 The layout of the building allows all rooms in the Monastery to be accessed from the Cloister. As you walk in the entrance, this outdoor space is the first thing you notice as a visitor. It calms you even before setting foot upon the smooth timeworn flagstones. 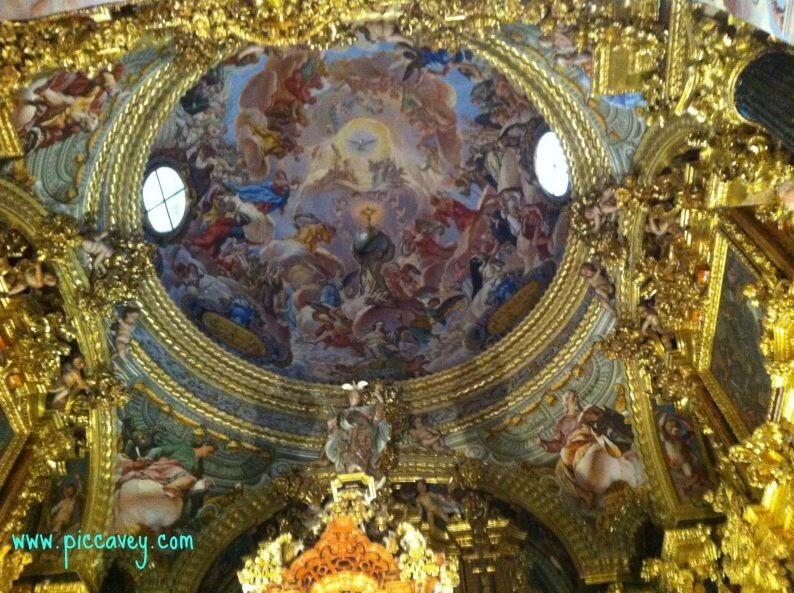 This building is one of the best examples of Spanish Baroque architecture remaining today. The vestry is particularly stunning. The intricate plasterwork, wooden carvings, paintings, columns, inlaid materials and marble features ensures that no area left uncovered. Quite a contrast after seeing the sombre exterior of the building. This Cartuja Monastery has been altered over the years. 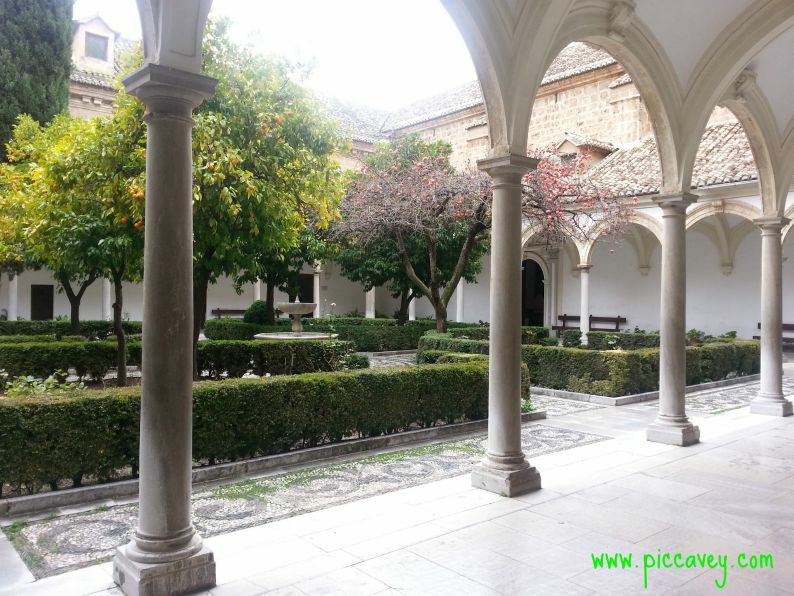 The rooms where the monks would have slept are no longer there, also the cloister is smaller than it would have been in it´s day. This is not the only remaining Cartuja Monastery in Spain. There are several which are actually still inhabitated. They are located in Burgos, Valencia, Zaragoza and Barcelona too. The photos of the grandeur inside don´t quite seem to do the building justice. The Sacristy and Church Altar certainly are quite spectacular. It takes a while standing there viewing each part to even begin to try to take in all the detail. The colours are vibrant and the delicate marble and wooden designs are clearly well looked after. As I left the Monasterio de la Cartuja something caught my attention in the small shop on my way out. A sign Reading: Hay Rosarios de Petalos de Rosa. I didn´t know what that meant so I went off to investigate. It turns out that here they sell Rosary beads as well as other souvenirs. However these beads are quite special. Made by convent nuns in Spain the Rosary is made from of real rose petals. It seems that they roll the petals together tightly until they form a ball. The final result of this delicate task is a Rosary in a coral red color, with the beads retaining their natural rose scent. So as the lady in the shop shows me the ítem, when opening the small keepsake box a beautiful rose perfume arises from the coloured beads. The white one shown in the photo is one I bought there but this was made from Jasmine petals. The scent is just like the fragrance of an andalusian Summer everning with the heady scent of Jasmine in the air. It´s a real treasure to have in my drawer at home. It would make an unusual souvenir or gift for someone too. How to get there: Take the bus U1, connect with the LAC bus from the city centre. I really enjoyed this post, your pictures have me dreaming of all of the events those walls have seen. I have yet to make it Granada but when I do (hopefully), I’ll keep this lovely monastery in mind. I’ve been here over seven years, there is soo much history I am still trying to take it all in.. I went to Cartuja once when I was living in Granada in the 1970s, my 20 year old self was not impressed. I love your photos though and the rose petal rosary sounds irresistible. I loved reading this and seeing the photos, I can smell the rosary beads from here! There are so many places in our cities that people miss out on because they only have time to “do” the more famous monuments, this being a perfect example! 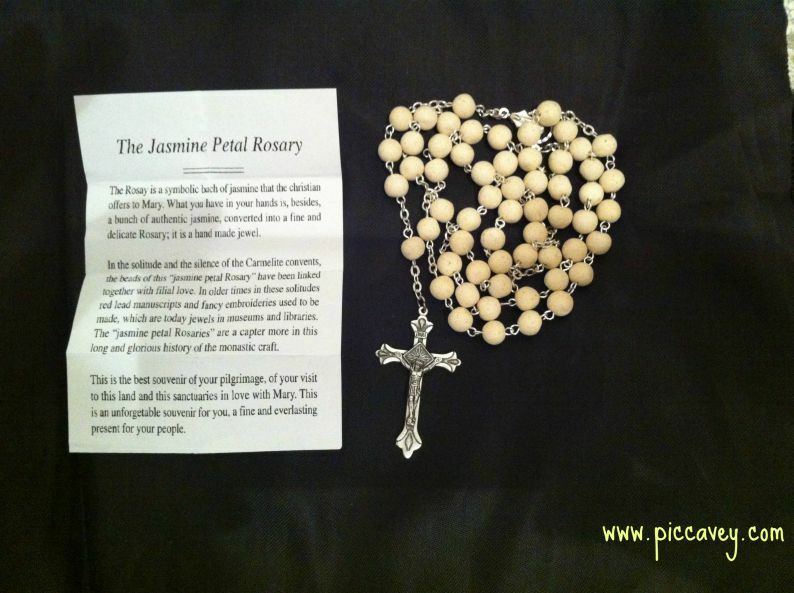 A rosary made of real rose petals? That is so precious. I’m not religious, but I’d love that as a souvenir. I hope that wouldn’t be offensive to Catholics, though. Always in awe of the over the top architecture. Thanks for the beautiful tour. My daughter studied abroad in Sevilla, Spain and one of her favorite places was Granada. 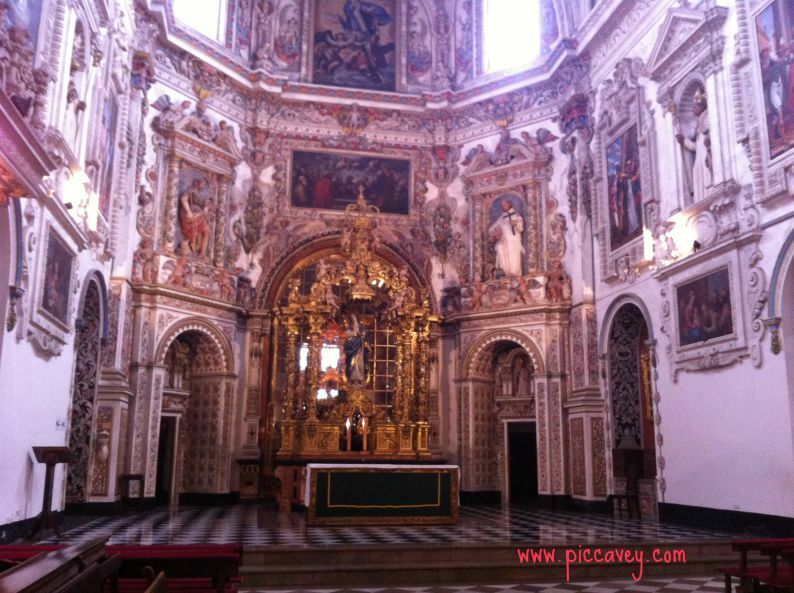 I would love to visit Granada and this lovely Monastery one day. Thanks for sharing. This is another one for the bucket list. What a lovely place. Visiting a monastery is always good. The quiet and stillness in there is comforting. Those rosaries made of rose petals are extraordinary. Will have to keep this in mind.